March is National Nutrition Month, and the theme for 2018 is to go further with food. I’ve tried to go further with foods by researching super foods around the world and had an aha! moment when a familiar childhood food popped up that I did not appreciate nearly enough while growing up in India. I am amazed to see the therapeutic value and healing capacity of this fruit. Gooseberry (Amla) has found its medicinal niche in Ayurveda, an ancient medicine system of India, due to its nutritional value with many healing properties along with its mixed and complex taste (sour, sweet, pungent, and sweet). This fruit is known to provide five of the six tastes, lacking only the salty taste. As a child I had issue eating this fruit due to its complexity in taste. I always enjoyed the sweet aftertaste, though. Pick a raw gooseberry fruit if you can find one; wash it and eat it to sharpen your taste buds. 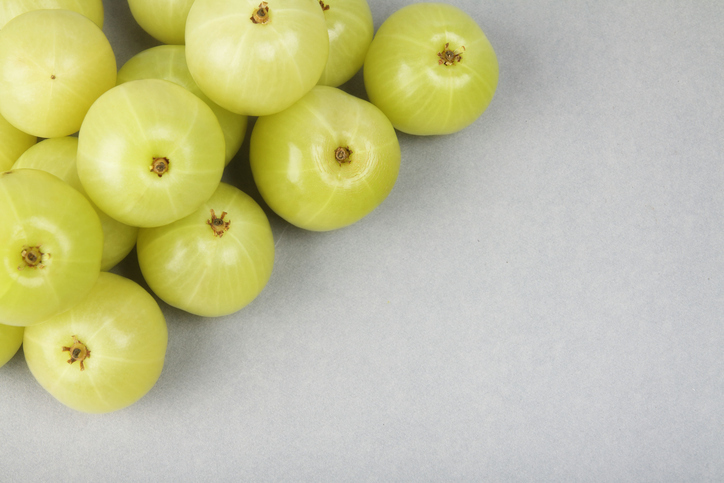 Besides its unique taste feature, gooseberry’s many health benefits come due to it being low in carbohydrates and rich in fiber, vitamins, minerals, and other therapeutic compounds like tannins. Indian gooseberries are exceptionally rich in Vitamin C and tannins that makes it a very powerful antioxidant that play an important role in elimination of free radicals, since most diseases sneak in when we have these free radicals floating around in our bodies. This fruit is widely used in Ayurvedic treatments to prevent diseases, as well as treatment for many illnesses. This super food is known to enhance digestion, balance stomach acids, supports the heart, and nourishes the brain and cognitive functioning. It is also known to strengthen lungs, improve skin quality, and promote healthier hair. This fruit also acts as a body coolant and flushes out toxins. It may be a little difficult to eat this fruit raw, so I’ve prepared a gooseberry (Amla) jam spread at home, and I am happy to report that it tastes delicious. I found this fruit frozen in a local Asian grocery store. So, go further with food and look for this super food in your grocery store and try it to optimize your nutrition, health, and wellness. Click here to access a full recipe!